Polling company YouGov has launched a new tool called Profiles, which reveals insights into ‘typical’ fans of everyone from One Direction to Alfie Boe. We've had a go ourselves and found out some intriguing facts about classical music fans. Disclaimer: the sample sizes are often small so take these insights with a healthy pinch of salt! 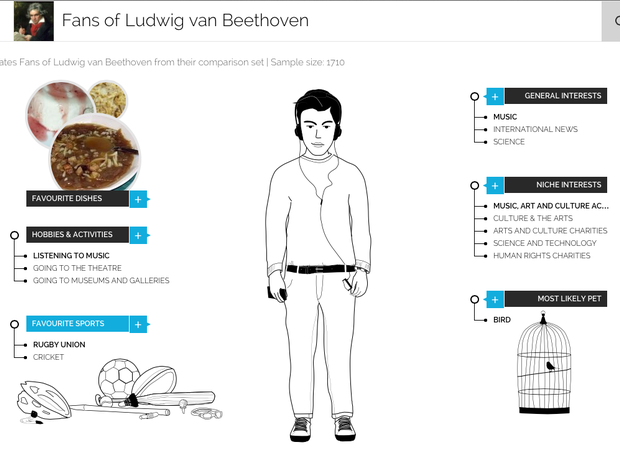 Fans of Beethoven are typically aged 18-24, own a pet bird and like French onion soup. If you enjoy listening to the music of Ludovic Einaudi, according to YouGov you’ll also read 'New Scientist' and enjoy the film 'Despicable Me'. Antonio Vivaldi fans are a health-conscious lot, always aiming for five portions of fruit and veg a day and watching less than one hour of TV a week. Fans of Philip Glass are also into figure skating. There’s a thing. Tchaikovsky’s fans are into Superbike racing and arts and crafts. Fans of Chopin say they would never go to bed without removing their makeup and are guilty of procrastinating. If you like music by Rachmaninov, you’ll also avoid genetically modified food but are partial to a cassoulet. … while John Barry’s fans just ‘don’t get vegetarianism’ and count nachos among their favourite foods. Fans of Edward Elgar’s music are – perhaps unsurprisingly – from the Midlands and – more surprisingly – count 'Sister Act' among their favourite films. If you enjoy the hypnotic music of Eric Whitacre, you’ll also play Angry Birds and have a bit of a sweet tooth, spending your spare cash on chocolates and sweets. If you fancy exploring the tool yourself, go to yougov.co.uk/profiler or click on the link below.